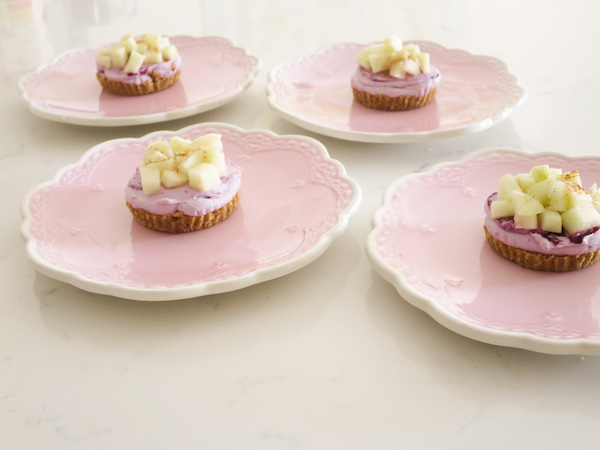 The idea for these mini no-bake cheesecakes simply came from the need of a tasty little treat for our Friday afternoon coffee. It was the 7th day of the ongoing sugar free August, which is by the way going great! Summer is naturally sweet time. Back in Finland I’d be picking blueberries, forest strawberries and raspberries in the nature and going to the outdoor markets to get the world’s best Finnish strawberries and sweet peas. In Israel I eat my frozen berries around the year but August is the hottest month of the year and fruits such as grapes, peaches, apples, and pears are the tastiest. 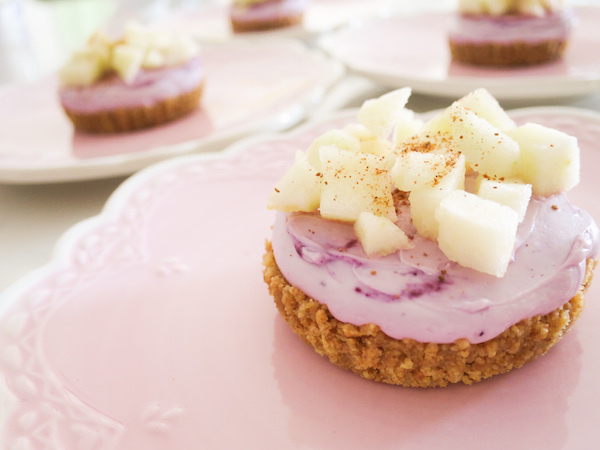 These super easy mini no-bake cheesecakes have something from both my favourites, sweet and slightly tart blueberry and crispy citric green apple with a hint of cinnamon on top. 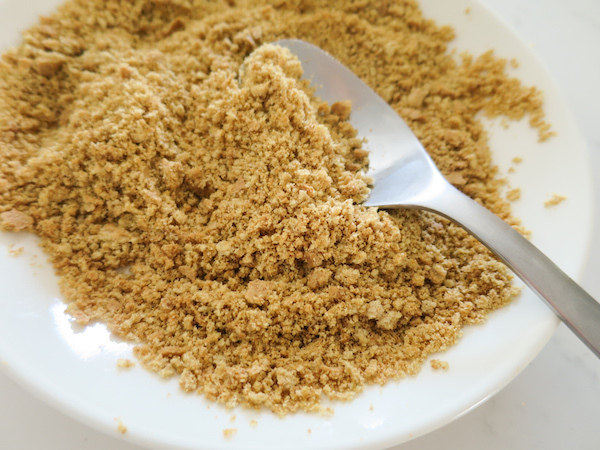 The generous crust of delightful buttery digestive biscuit crumbs is made from my latest find in the IKEA food section,Göteborgs Kex Digestive without sugar. 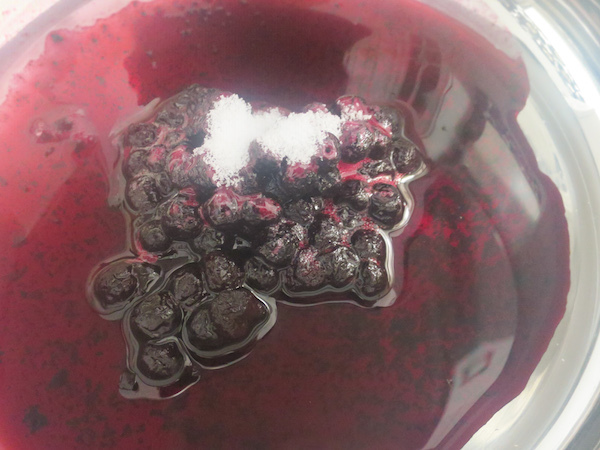 Place blueberries, water and stevia in a small saucepan and bring to boil over medium heat, while constantly stirring allow to boil for a minute. 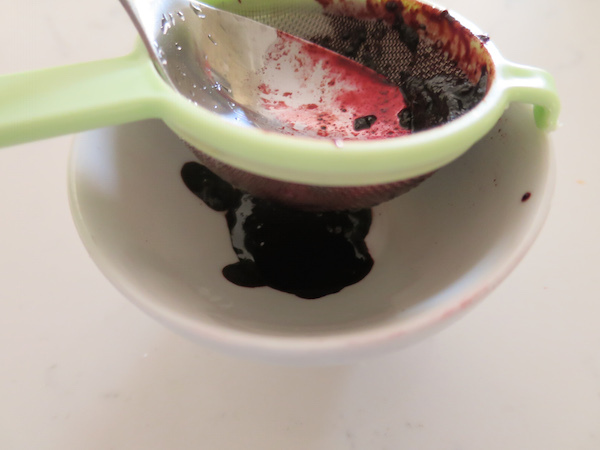 Push boiled berries through a sieve and preserve the concentrate. 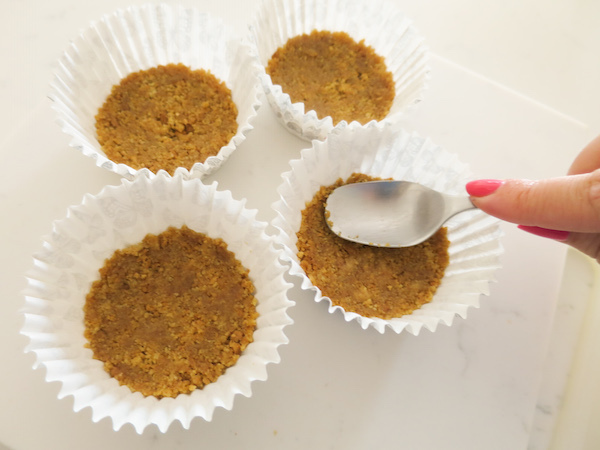 Crush the digestive biscuits into fine crumbs and mix in melted butter. 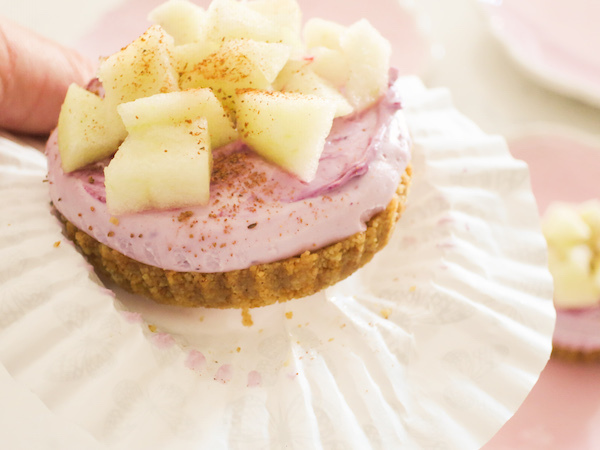 Divide into 4 cupcake cases and press the crust onto the bottom. 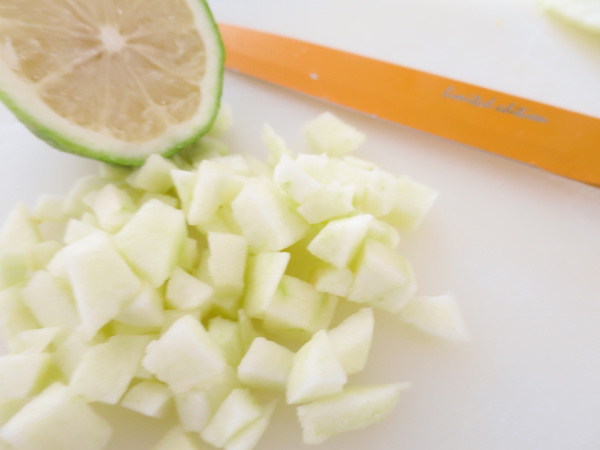 Cut apple into small cubes and brush with lemon juice to avoid browning. Set aside. 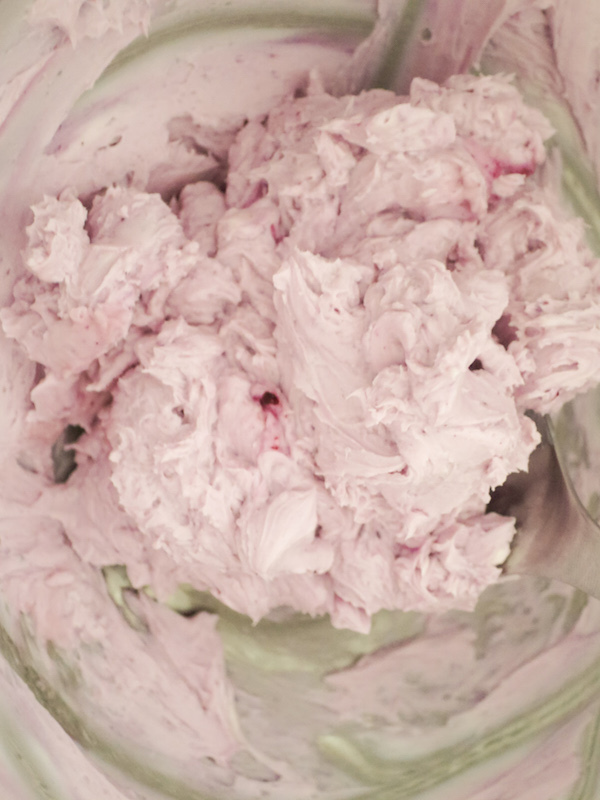 Place cream cheese, honey and blueberry concentrate into a mixing bow and beat until incorporated and smooth. 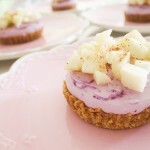 Place in a piping bag and pipe or spoon and spread the cream cheese over the pressed crust and cover with apple cubes. 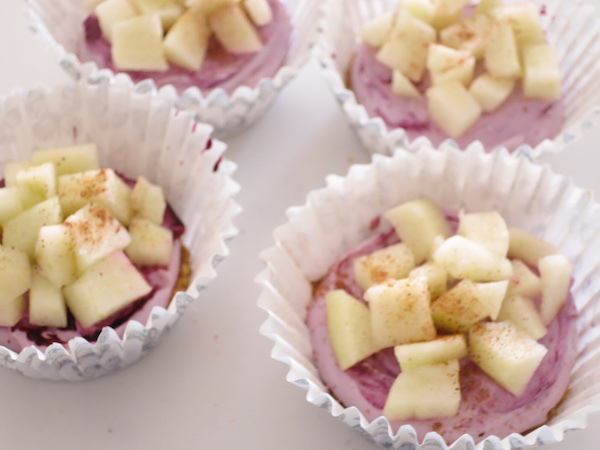 Sprinkle ground cinnamon over the apple cubes. 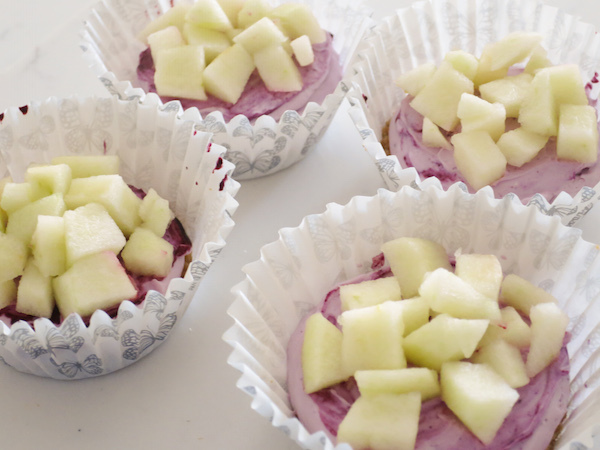 Remove from cupcake cases before serving.